Jergens StayLock Toe Clamps are designed for edge gripping of parts when the clamp height must be kept at a minimum, such as in a milling operation. They are available in Low Toe (62811) or High Toe (62812) styles. 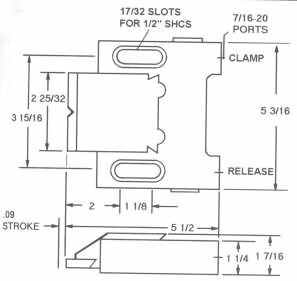 Toe Clamps provide two directional clamping forces: one pushes the workpiece against a positive stop, the other pushes it down against the table or fixture. A brass or steel insert is available on the low toe style Toe Clamp. The inserts must be ordered separately. IMPORTANT: Jergens 62811 Toe Clamp is supplied without toe insert. Please order one of the inserts below. Two special washers which prevent damage by the cap screws are included with each toe clamp. To order washers separately, order Part Number 60636.